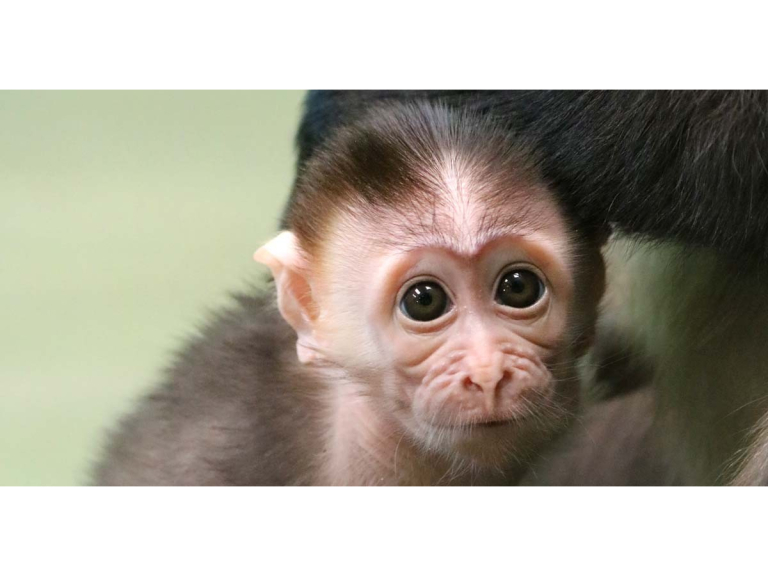 Precious and tiny, this rare primate baby takes her first steps out into the big wide world… This female cherry-crowned mangabey was born recently at Paignton Zoo Environmental Park in Devon. The as yet un-named youngster has already been photographed out and about with father Yengo and mother Kibibi, as well as older brother Yankari, who was born at the charity zoo in 2015. This is a forest primate of coastal, swamp, mangrove and tropical West Africa. It lives in large groups made up of one male with the females arranged in a heirarchy. The males are larger than the females and leave the group when they reach maturity. The gestation period is 5 to 6 months, after which a single baby is born. While her group lives safely at Paignton Zoo, her species in the wild is threatened by deforestation and the bushmeat trade. Cherry-crowned mangabeys are found in a number of protected areas, including the Omo Forest Reserve in Nigeria, where Paignton Zoo supports a conservation project. They are classified as Vulnerable by the International Union for the Conservation of Nature and listed on Appendix II of CITES and on Class B of the African Convention on the Conservation of Nature and Natural Resources. Paignton Zoo Environmental Park is a registered charity. For more information go to www.paigntonzoo.org.uk or ring 01803 697500.